This Water Slide Includes a tunnel and a water-spraying rail! AND! two BONUS inflatable body boards! Two awesome water park slides in one! Climb the towering 18' long slide and plunge into the splash pool below. 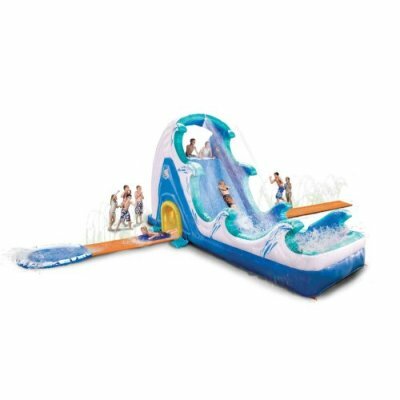 Then dive through the water tunnel on the 25' long speed slide for the ultimate rush! Inflates in less than 2 minutes and attaches to any hose for fast and easy setup.